I’ve decided to write this post in two parts, as otherwise it would contain the ingredients and methods for three recipes. The Coffee Cake recipe, along with the butter-cream filling and topping will follow in the next post. Most coffee cakes are traditionally decorated with butter-cream and walnut halves. 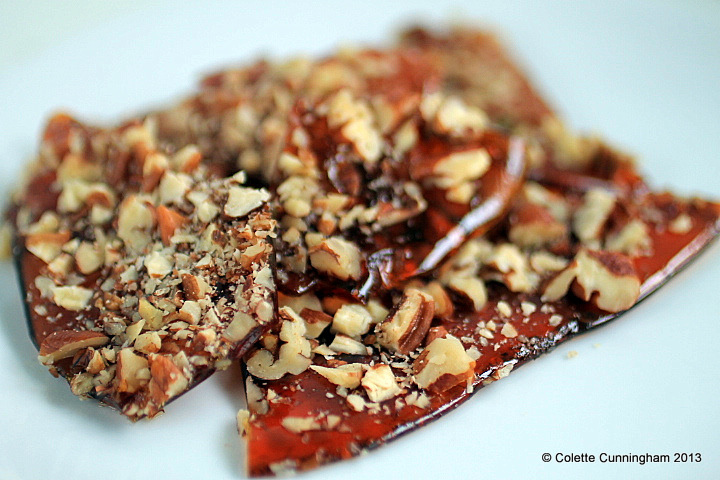 This Pecan brittle is something a little different. It is not difficult to make, but you cannot take your eye off the saucepan while doing so! Lightly oil a medium/large baking sheet, and place in the oven to heat through. This will stop the sugar hardening as you pour it on to the baking sheet. Place the sugar in a saucepan and allow to melt on a low to medium heat. Swirl the saucepan every few minutes, but to not use a spoon. Tip 1: When melting the Sugar* do not, under any circumstances, be tempted to stir it with a spoon. If you do, you will cause the sugar to crystallise. Carefully swirl the sugar in the saucepan instead. 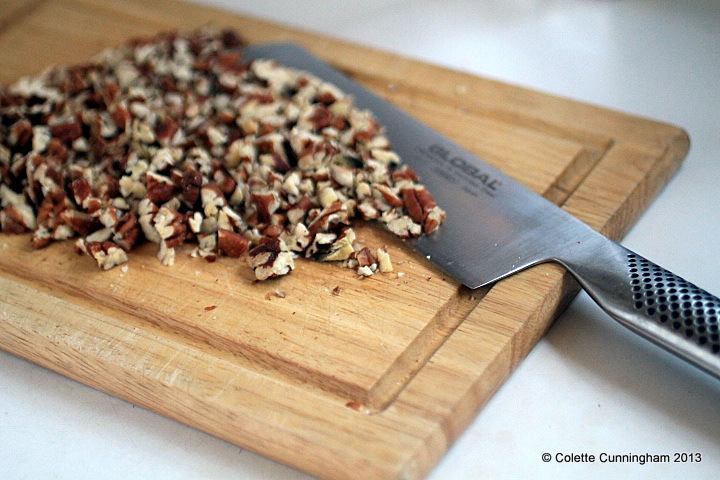 Carefully, pour the melted sugar on to your baking tray, sprinkle on the chopped pecans and set aside to cool. Once cooled, place the brittle in a plastic bag and smash it into small pieces with a rolling-pin. Put the pieces in a food-processor and blitz until it resembles “dust”. This, I have found, is the best way to use it. Tip 2: To wash up the saucepan, set aside and leave it to cool completely. Any remaining sugar will harden. Once completely cold, use boiling water to wash and rinse. Coffee Cake Recipe and assembly to follow in Part 2.